What started off as a dull round of games turned into a rather entertaining night of football. VAR's first ever goal was awarded to Leicester, while fellow Premier League side West Ham were made to wait until extra time before managing to overcome Shrewsbury. 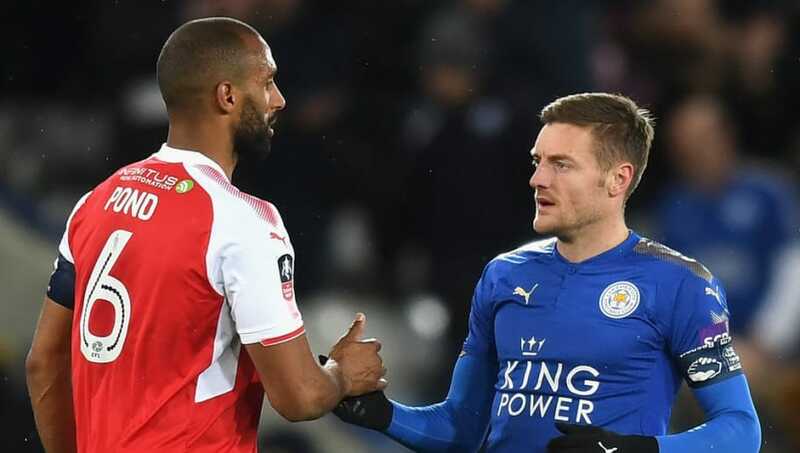 Top flight outfit Leicester made their way into round four with an elementary 2-0 victory over League One's Fleetwood Town, in a game which saw VAR award its first ever goal. It took the Premier League side a good 43 minutes to get the ball in the back of the net when Kelechi Iheanacho broke the deadlock against the visitors. However, the Foxes almost missed out on their second when referee Jon Moss adjudged Iheanacho offside on the 77th minute. However, with the help of VAR, the decision was overturned and the Nigerian was awarded his brace - comfortably seeing his side progress. But wait...! Thanks to VAR, it's a GOALLLLL! The night's highest scoring game saw Mansfield knocked out of the FA Cup by Championship side Cardiff - Junior Hoilett's 94th minute volley from outside the box being the pick of the lot. The game went from zero to one hundred in no time when Cardiff went 1-0 up through Bruno Ecuele Manga on 34 minutes, only for the hosts to equalise only one minute later. However, the Welsh outfit's lead was restored 20 minutes after the break when Hoilett found the back of the net on 66 minutes. The Championship side all but guaranteed their progression into the fourth round with Anthony Pilkington netting his side's third, five minutes later; before Hoilett sealed the deal at the death with a 25-yard volley. Sheffield Wednesday booked their fourth round spot with a comfortable 2-0 win over Carlisle, goals from Atdhe Nuhiu and Marco Matias seeing them through. The hosts took the lead just before the half hour mark when Matias was rolled in by George Boyd - finding the back of the net from just inside the box. Matias then became the provider for the Owls' second goal - assisting Nuhiu as Wednesday doubled their lead. It took West Ham a staggering 112 minutes before breaking the deadlock against Shrewsbury, the League One outfit putting up a good fight against the Premier League side. However, it was the Hammers that eventually progressed from round three on Tuesday evening. With the score remaining level for the entirety of the 90 minutes at the London Stadium, those still awake within the ground were treated to another half hour of football - and were made to wait until eight minutes from penalties before seeing the ball hit the back of the net. Assisted by Antonio Martinez, Reece Burke eventually scored the winner, as his side just about managed a 1-0 win. A hat-trick of tap ins from Reading's Jon Dadi Bodvarsson allowed the Berkshire outfit to enter into round four, leaving League Two side Stevenage deflated in their hopes for an upset. Now that Liverpool have ended Man City's unbeaten streak will the Citizens be able to go the rest of the EPL season unbeaten? Bodvarsson gave the home side the lead on 32 minutes - a close range effort that looked harder to miss than to score. The Icelandic forward then earned his brace a minute before half-time, handing Reading a 2-0 heading into the break. His hat-trick was then polished off with another close range effort - all but finishing the time half an hour before the end.